Chances are, if you have tried to cut down on sugar, you have heard of agave. There is quite a bit of negative information about agave on the internet. You may be wondering if it is healthy. I have learned that not all agave is created equally. I am just starting up again. I have always loved to sew and create and started making things for local friends and it is taking off from their. My mom is my inspiration, she is a very creative woman and has created many things that were considered "impossible". I have been creating since I was in high school and would sew diapers and accessories for my daughter. My daughter is my motivation. I want to show her how to live with an eco friendly mind and encourage her to make healthy green choices. When I have a day off, I love spending the time with my family, at the park, beach or just the back yard. I was late coming to cloth diapering. When my son was born, 4 and a half years ago, we tried cloth diapers, but were operating on very little information. We just bought prefolds, pins and plastic pants. Our son was a preemie, but had grown to 28 pounds by 9 months! His thighs and plastic pants did not do well together. We gave up until I got a great tutorial when my daughter was over a year old and jumped right in. When we found out our favorite local shop, The Cloth Nook, was closing my husband and I decided to take over. I have been teaching childbirth classes for a couple of years and love to learn and teach about all things natural. Cloth diapers fit right in! My husband was really excited about the business and we decided that having a family business was an idea worth working for. We wouldn't be here today if he hadn't pushed me to take the leap. My name is Michele Zook. I do the sewing and my husband, Jon, is developing our website. I stayed home with our children for many reasons. One being my husband's long commute to work and his erratic work schedule. I enjoy being at home, but it is not easy making ends meet with one income. I used cloth diapers, so the idea started from there. So, I can be at home with our small children while helping to contribute a bit to the finances. Being able to stay home with our children is my inspiration. My mom used to be a seamstress by trade, so I guess it might be in the genes. I have been sewing for about 2 - 2 1/2 years. I have always enjoyed crafting. Once my children are in school full time, I want to be able to still be doing what I am doing. I love the freedom that being my own boss gives. Thanks for joining me for this fun event! 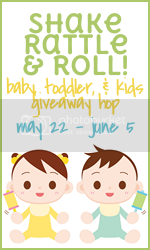 The Shake, Rattle, & Roll Giveaway Hop features a variety of great products for kids of all ages! Once you have entered to win here, be sure to visit all of the participating blogs at the bottom of this post! Headline Shirts was founded on San Jose Ave. in San Francisco in 2005. The company grew tremendously and after three years, in 2008, they moved to a busy new headquarters, still in San Francisco. The shirts have remained consistently awesome, made with eco-friendly ink and hand sewn in San Francisco. Not to mention they are very funny! Headline shirts was kind enough to let me pick out a tee for my 3 year old, Chase. We were given a code and I ordered it online, just like a customer would. The website layout was easy to order from. Chase chose the yellow tee with the flying squirrel. We ordered a 4T. The shipping was amazingly fast! They ship within 24 hours after you place the order! When we received the shirt Chase was very eager to put it on but we had to get some good shots of it first. I’m so excited to be part of a #SuperEvent Giveaway! This is a group event and we have all teamed up to bring you the opportunity to win $200 credit for some amazing herbs. TriLight Health is a high quality liquid herbal product supplier! This event is hosted by Full Price? Never! with contributing bloggers CuzinLogic and MyCraftyLife. About TriLight Health: For over 20 years now, TriLight Health (formerly TriLight Herbs) has faithfully supplied their customers nationwide with their high quality line of liquid herbal products. They were the first company to specialize in great tasting, non-alcoholic herbal formulas for pregnancy, children, and the family. Their exclusive 3 Stage Liquid Light Process is what makes their products Fast Acting and Effective for Adults, but Taste so good that Children will Love them! Check out my review of one of their herbal extracts! 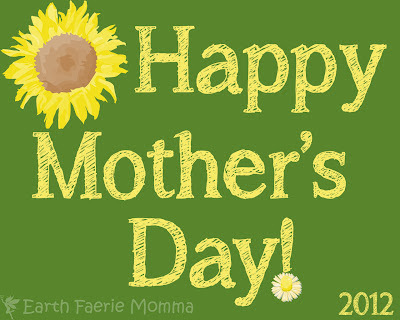 Happy Mother's Day to you the wonderful Moms out there! I hope you all take it easy because you deserve it! Different types of cloth diapers has been moved to Organic Eco Baby. Since the first Great WAHM Event was so successful, we have decided to add another one! The only entry required is to hit the first green button, all other entries will just boost your odds in winning. Remember that if you come back each day and "tweet" the event, you will grow your chances even more! Please note that we are drawing a different winner for each prize, so I encourage you to go to each of the sponsors pages and have a look around at the great prizes you can win. The Mother's Day Cloth Diaper Giveaway Hop is hosted by Daily Mothering! 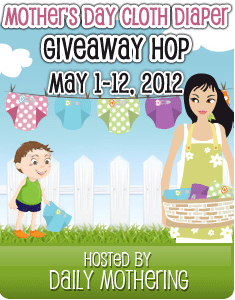 80 blogs have linked up to bring you TONS and TONS of exciting cloth diaper giveaways. Enter below for your chance to win 3 cloth diapers and a wet/dry bag! Then hop to the other blogs listed at the bottom of this post to enter their fluffy giveaways too!